The Tag Heuer Grand Carrera WAV5113.FC6231 men’s watch is a luxuriously designed model of the Tag Heuer brand that will ensure many compliments from anyone who sees you wearing it. 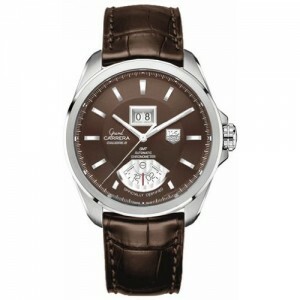 It marries Tag Heuer’s design philosophy that of class and luxury. Tag Heuer continually releases great watches that are durable and convenient for a wide range of occasions. This watch will surely add flair and fashion to your collection of timepieces. This watch’s design is durable, has a defined look of luxury, and comes packed with must have features for any watch. What is first striking to the eye is that it is an elegant brown that emanates a great sense of style. 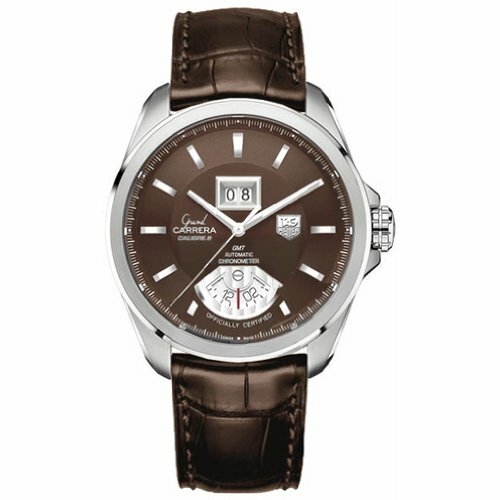 It has a brown dial with markings for hours, minutes, and seconds. It also features automatic movement. The date is positioned at the 12 o’clock for easy readability. It is stainless steel and water resistant 100 meters (330 feet). However, because of its leather strap it is doubtful that anyone would want to do laps in a pool with it on. It is just too sleek of a watch to bring to its limits. It retails for US $5100 but a quick search on Google yields significant discounts. For instance, I found one significantly discounted to $3095. You just have to be willing to do the legwork of shopping around online for a bit to find the price that suits you. You will not be unsatisfied with your purchase, whatever the price. The TAG Heuer brand is synonymous around the world for their dedication to high quality. TAG Heuer is unrelenting in their efforts to ensure the quality of all its watches. They rigorously test all pieces of the watch and ensure that each piece of the watch lives up to the TAG Heuer brand name. Purchasing a watch from TAG Heuer is purchasing a guarantee of quality. Although its brown color is unique to the eye, it may not be for everyone. A leather strap, while offering a greater degree of size adjustment for the wearer, may also not be for everyone when they are searching for a watch. Some people do not like the way leather breathes on a watch and this may be a turn off in making a purchase. However, its rich design may prove overwhelming in comparison to these factors. I highly recommend the Tag Heuer Grand Carrera WAV5113.FC6231. It adds to an already fine collection of TAG Heuer watches and will surely add to your personal collection of timepieces.